We are a non-profit organization intended to bring together individuals and industry representatives interested in supporting a qualified and diverse cyber workforce. Community Outreach is critical to ‘Inspire‘ the next generation. Networking through Cyber ‘Meetups’ brings Women in Cyber together. Mentorship allows seasoned professionals to connect with and ‘Invest‘ in young adults, students and junior professionals for development. Choosing to pursue a cyber career is just the beginning. Study groups and training programs help to ‘Educate‘ aspiring resources. Job Fairs and Scholarship programs can help to ‘Recruit‘ and prepare the next generation of cyber warriors. 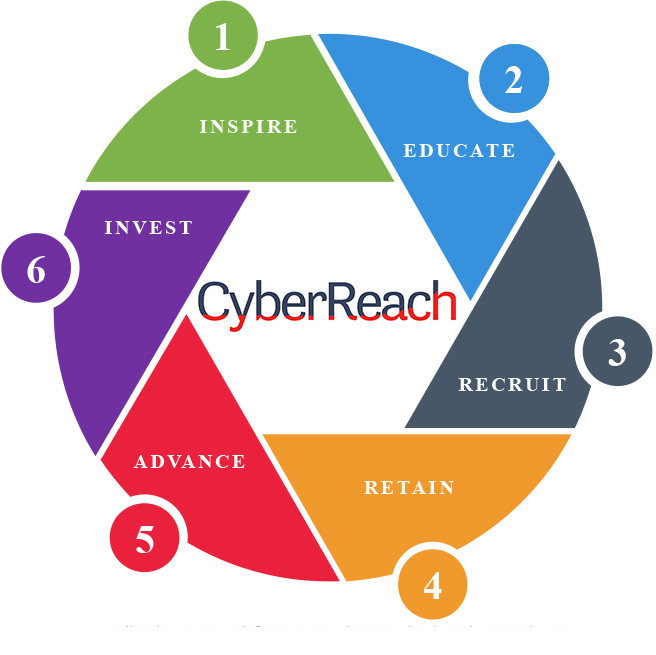 CyberReach partners with Universities, Agencies and Industry to support various diversity programs in order to ‘Retain‘ and ‘Advance‘ resources. We must open opportunities for career development and consider leveling the playing field for women in cyber.